What a pedigree Noel Redding has! Still active in the world of Rock music, he is cur-rently entering his fifth decade in the business. Of course, many people still remember him from his time with the legendary Jimi Hendrix in the Sixties, but there is a lot more to Noel and his music than that. Such an association would, of course, be a high spot in any musician's career, but, as this бlbum demonstrates, Noel is at home with such staples of his repertoire as Eddie Cochran's 'Summertime Blues', John Lennon's 'Rain' and Bob Dylan's She BelongsTo Me' as he is with those classics from the Hendrix days. 'Hey Joe' and Can You See me'. Mix in some numbers which have become blues standards like 'Not Fade Away', 'Wee Wee Baby' and Lawdy Miss Clawdy' and you have a rounded por-trait of a man who has the music in his blood. Recorded live in San Francisco and Los Angeles with the band '305 A.M.' in the late Nineties, it shows that Noel is still a master of his craft. Born on Christmas Day 1945, Noel Redding learned to play both violin and mandolнn as a child, before settling on the guitar at the age of fourteen. On leaving school at the age of seventeen he turned professional, playing clubs in Germany with the bands the Burnettes' and the 'Loving Kind'. He carne to join Jimi Hendrix by a rather circuitous route. Noel had to audition for Eric Burdon who was in the throes of forming The New Animбis. As it happened Chas Chandler, who was also listening to the musicians, was looking for a bass guitarist for another band. Noel had never played bass before but, in the absence of any firm proposal from Burdon, agreed to try when Chandler offered him a gig on the instrument. It turned out that the group involved was the Jimi Hendrix Experience'.As Hendrix put together his band, Noel was asked to join on a regular basis. The first to be recruited, he was soon joined by drummer Mitch Mitchell. The late Sixties was an exciting time in Rock music with Jimi Hendrix among the most radical, innovative musicians then active.The story of the band is too well-known to need repeating in much detail here. Suffice it to say that Noel recalls relationships between Hendrix and the other members becoming rather sour after a year or so, as Jimi became increasingly conscious of his superstar status and began to look down on the rest. Fuelled by copious use of drugs, everything fell apart rapidly, culminating in Hendrix's death in 1970. Thankfully for Noel Redding there was life after the Jimi Hendrix Experience. He formed 'Fat Mattress', whose personnel included vocalist Neil Landon, singer-bassist Jimmy Leverton and drummer Eric Dillon.The band released two albums which were fairly successful, then toured both Germany and the United States. Its popularity was greater overseas than it was in the UK. However, again, differences among its members caused Noel to seek pastures new. By now living in the States, he set up a three-piece Heavy Metal group called Road', which cut an бlbum for Kama Sutra', before quitting and moving to Ireland in 1972. Loving the slower pace of life in the Emerald Isle', Noel still found the lure of music hard to resist. He put together a band with Eric Bell from "Thin Lizzy', which also fea-tured Dave Clark (not to be confused with the man who gave us 'Glad All Over' and other such gems) on keyboards and Leslie Samson on drums.After it gained a recording deal with RCA, the company insisted that the new group should be called The Noel Redding Band' rather than its creator's preferred сame Clonakilty Cowboys'. By way of compensation this was used as the title of the bands first бlbum.After three tours of Holland, two of England and a ten week visit to America, Noel found that the band's money was being mishandled by its management. He sued them and subsequently broke up the group. In more recent years Noel Redding has continued to play gigs, albeit on a less regular basis than in the Sixties and Seventies. He continъes to revel in his life in Ireland and has written a book in conjunction with his partner Carol Appelby. Entitled Are You Experienced? ', it promises to be the first true insight into the Jimi Hendrix years. Noel certainly has a tale to tell on that fascinating subject. Noel is glad to be free of all the pressures and constant travelling involved in being on the road. It enables him to enjoy his forays into music far more than he did thirty years again. He has acquired a new, relaxed maturity which makes his playing here such a joy to hear. 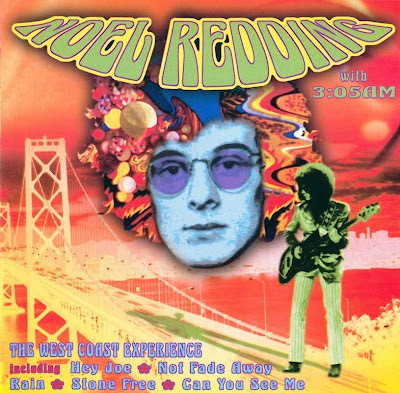 Noel Redding is a great survivor.